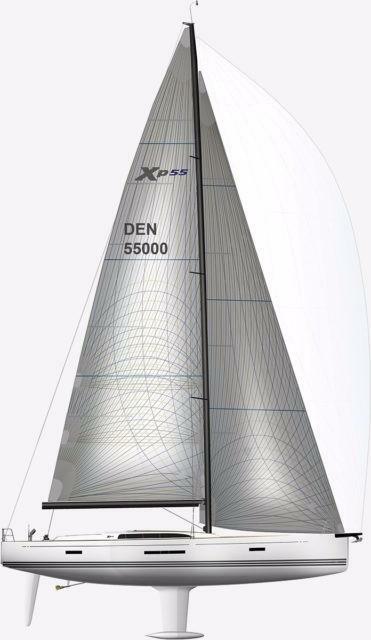 This listing is for a new boat, built to order at the X-Yachts factory in Haderslev, Denmark. 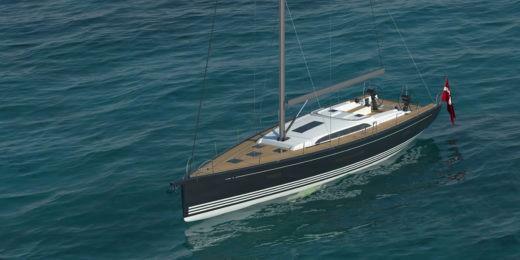 "It is a pleasure to be at the helm of this yacht and feel its response... 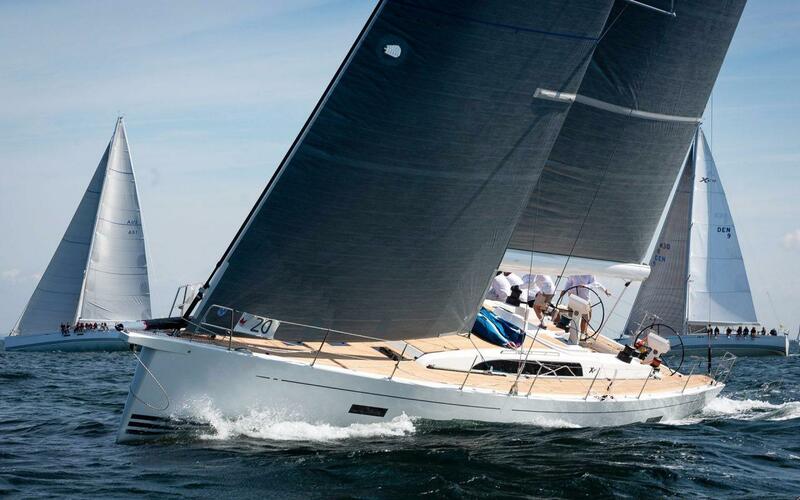 The balance and subtle trim of the sails is directly passed on through the wheel." The Xp 55 hull is a composite construction, moulded in a 5-axis-milled female tooling. 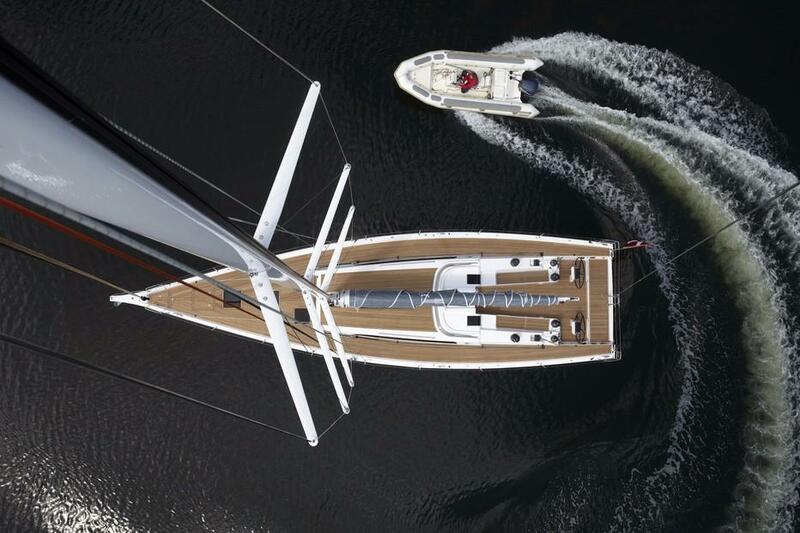 X-Yachts hulls are built using the latest construction technologies with a vacuum-infused, post-cured epoxy construction. The hull is a full sandwich construction, using foam core, biaxial E-glass skins and local E-glass unidirectional reinforcements strategically positioned for strength and weight optimization. All structural bulkheads are securely bonded to hull and deck. All bulkheads of marine plywood in thicknesses between 16 and 24 mm. 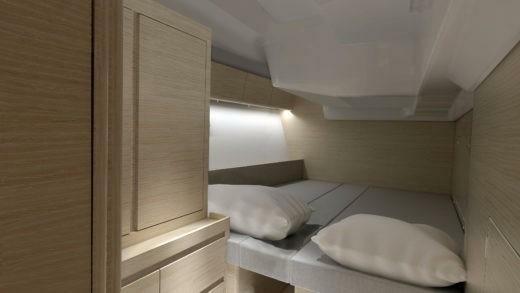 At the forward end of the boat watertight bulkheads separate the anchor compartment, sail locker and interior accommodation for safety and reassurance in the event of a collision. The keel structure consists of carbon grid structure which forms an integral part of the hull structure. It is capable of absorbing loads from keel and mast as well as shock loads in the event of grounding. Integrated limber holes are positioned in order to allow water to run to the central keel bilge. The keel structure also has an integrated single point centre hoist for easy and safe lifting and launching. The keel consists of antimony hardened lead T-bulb bolted and glued to cast iron fin for high strength, low centre of gravity and comfortable sailing performance. 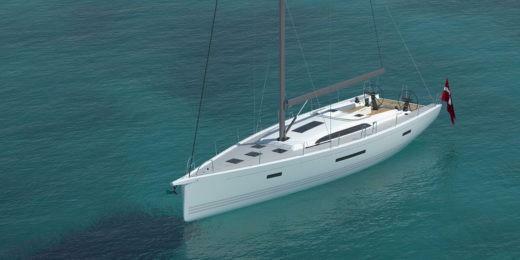 Ballast weight with the standard keel is approximately 6,500 kg (14,330 lbs). Each keel is encapsulated in three layers of CSM E-glass with epoxy matrix and faired to original keel section templates. The keel is securely bolted to the carbon grid structure frame with stainless steel bolts and faired. The rudder blade is constructed from sandwich GRP. Rudder stock constructed of solid, high strength aluminium with welded spokes, which transmits the steering torque into the rudder blade. 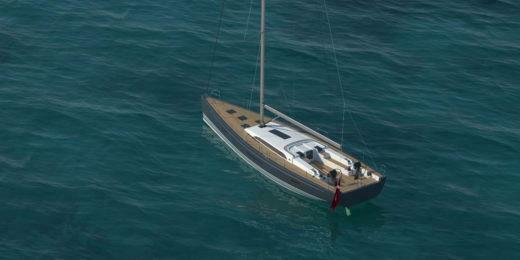 The rudder stock is mounted through a needle bearing at the hull and self-aligning bearing at the deck to achieve minimum friction for effortless sailing. Two wheel pedestals in GRP, black grey Gelcoat painted, offer an excellent helming position on each side of the boat. Optional instrument pods are available to customize the pedestal arrangements (see price list). Each pedestal is fitted with a 110 cm (3’6”) diameter composite GRP wheel in black. The deck is a hand lay-up, full sandwich construction, which provides both strength and insulation. The deck uses a polyester resin system and the skins are biaxial E-glass layers with strategically positioned local uni-directional reinforcements. In load bearing areas, such as under deck fittings, either plywood or aluminium replaces the foam core. The transom hatch closing the integrated tender garage is electrical operated, and when lowered also acts as spacious bathing platform. The integrated stainless-steel boarding ladder with teak steps unfolds as the transom hatch opens. The stainless-steel bathing ladder can be hooked onto the bathing platform when lowered. The tender garage transom opening is offered with optional PVC cover with X-Yachts'' logo. All halyards and trim lines are concealed below deck and led aft under the coaming, port and starboard, to self-tailing winches near the helmsman. The standard furling headstay makes sail handling simple. The four main cockpit lockers are fitted with gas springs for easy lifting and smooth operation. The hull above the waterline is ‘Pure White’ (RAL 9010) gelcoat with 3 waterline stripes in ‘Light Grey’ (RAL 7035) as standard. Other hull colour options include - see price list for details. The deck is standard ‘Pure White’ (RAL 9010) gelcoat with sidedecks in ‘Light Grey’ (RAL 7035) gelcoat. Deck has antiskid surfaces where appropriate. Below the waterline, the hull and keel can be optionally antifouled with 3 coats of Hempel gel primer and 2 coats of Hempel Mille NCT self-polishing antifoul. 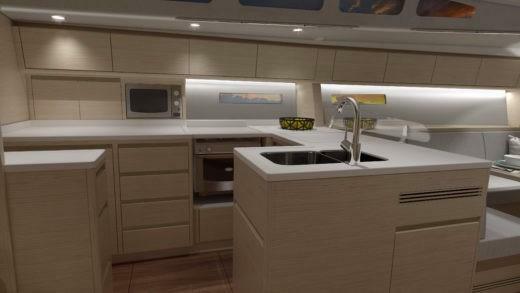 The overall impression of the Xp 55’s deck is clean and uncluttered with frameless deck hatches. Halyards are led underneath the deck. Two compartments for rope storage are integrated under the side deck. 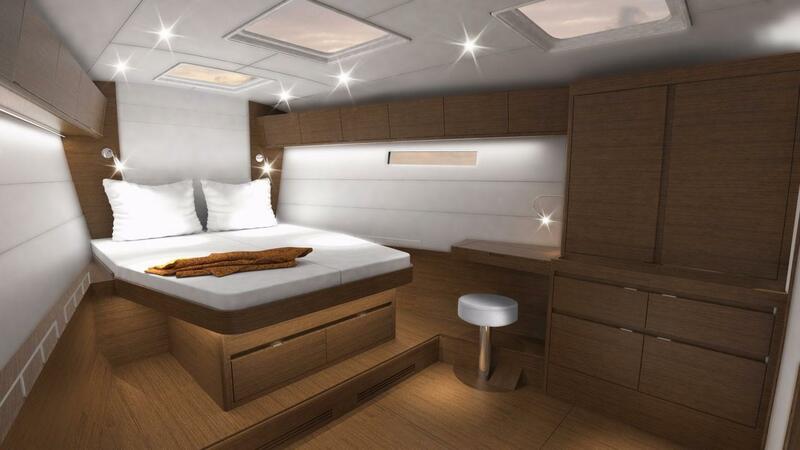 The deck features four openable frameless skylights on the fore deck and two flush hatches give access to the sail locker (dry compartment) and anchor chain locker that provides storage for anchor gear including up to 75 metres of chain. Four openable frameless skylights are fitted on the coach roof (two on the centreline and two near the companion way) and three fixed windows on coach roof provide light and excellent ventilation to main cabin and aft cabins. Vacuum applied teak deck standard on cockpit seats, cockpit sole and transom bathing platform. Optional teak on side decks and coach roof. Teak is nominally 9 mm thick and is laid using Sikaflex adhesive (or similar) with no visible fixings. Black caulking as standard. 2 x Harken Performa 80.3 STP three-speed self-tailing genoa winches, aft of cockpit bench. 2 x Harken Performa 70.2 STP two-speed self-tailing mainsheet winches/halyard/control lines, aft of cockpit bench. Optional electrical winch upgrades available. 2 x new style stainless steel bow pulpit with integrated LED navigation lights. 2 x new style stainless steel stern pushpit. 1 x central aft pushpit with integrated LED stern light. 1 x flag holder to starboard. 14 x 600 mm stainless steel stanchions and new style bases with double stainless steel wire guardrails, mounted on bulwark. Optional boarding gates on each side (2). 1 x stainless steel stem head fitting with roller designed to stow a Delta anchor up to 25 kg. 2 x stainless steel hand rails on top of coach roof. 1 x stainless steel pad eye for code 0 at bow. 4 x New style retractable mooring cleats (from Seasmart) mounted fore and aft, including stainless steel protection strip fitted at each cleat. 4 x Stainless steel folding padeyes for safety lines and harness mount points in cockpit. Foot blocks (5+2 pcs) at mast base for halyards, reef lines, vang and outhaul. 2 x Deck organisers for halyards and control lines. Lines led back to aft cockpit coamings. 10 x Spinlock XTS Clutch for sheets & halyards. 1 x centre pad eye for mainsheet system led to winches on each side of the cockpit. 2 x Genoa tracks mounted on deck, sheets run aft to genoa winches (port & starboard). Adjustable genoa cars with lines led to cockpit cam cleats. Deck fillers for fuel (x1) and water tank (x1). Deck outlet for holding tank (one per toilet). A 1500W 24V electric anchor windlass is installed in the sail locker. The windlass is two-way and operated by adjacent wired remote stored in anchor locker or an optional remote panel located at the helm. A 25 kg delta anchor is stowed in the stem head fitting with 50 metres of 10 mm calibrated (75 m optional – see price list), galvanised anchor chain. 1 x Anchor locker hatch. 1 x Sail locker hatch. 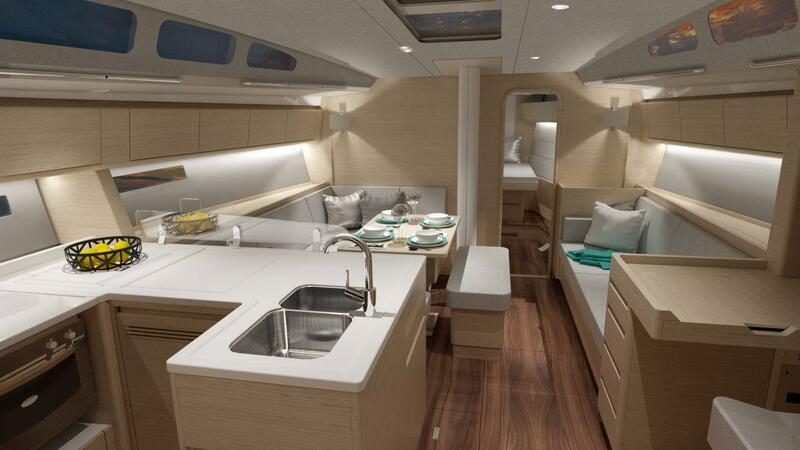 2 x 620x620 flush hatch, self-draining – on foredeck. 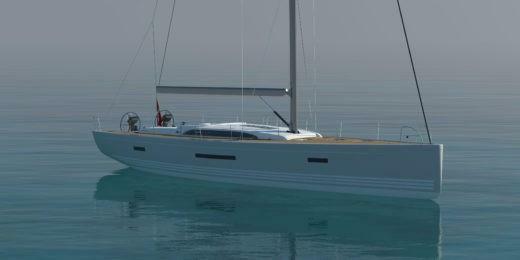 2 x 577x577 flush hatch, self-draining – on foredeck. 2 x 577x577 flush hatch, self-draining – on coach roof. 1 x 577x577 fixed window, self-draining – on coach roof. 2 x 330x330 flush hatches, self-draining – on coach roof (aft of sprayhood) with additional fixed part for additional light. Coach roof side windows. Long fixed sections with two openable portlights each side. 1 x Companionway sliding hatch in 12 mm white Plexiglas, housed in a self-draining garage. Wash board system in 12 mm smoked plexiglass, housed in a self-draining garage. 2 x Opening portlights 446x189 in cockpit provide additional ventilation into the aft cabins. 2 x Cockpit seat locker hatches fitted with gas struts. 1 x Gas locker hatch in centre aft area of the cockpit. 6 x Hull portlights in laminated hardened glass (recessed, grey tinted). 2 x Integrated teak foot chocks for helmsman position. 1 x Cockpit table (optional see price list). 1 x Life raft storage compartment. 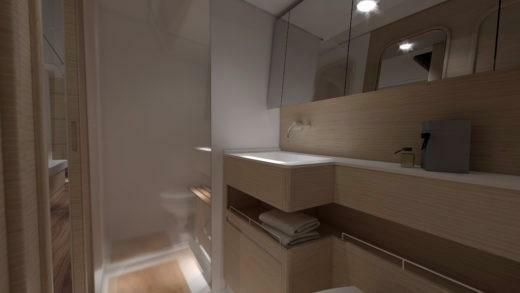 A Whale Twist deck shower connected to the yachts hot/cold fresh water system is fitted as standard in the cockpit. Optional spray hood in Swela ‘Light Grey’ (37362) canvas supported by a stainless steel framework (3 hinged frames). Whilst housed on the deck, the spray hood is covered by a canvas cover of same colour. 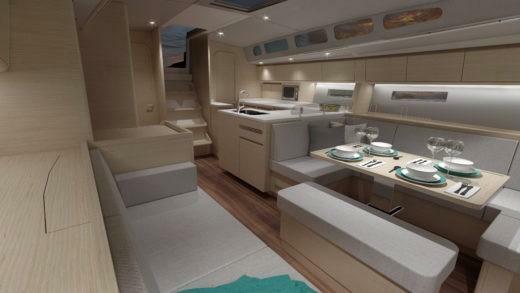 Optional bimini solutions available for helm position and forward cockpit – see price list for details. Alternative canvas colours also available. Fractional triple spreader, tapered silver anodized aluminium mast stepped on carbon mast base frame, designed and engineered for the Xp 55. Mainsail luff track integrated and sheaves for 1 main, 2 spinnakers and 1 genoa. More sheaves available with optional equipment. Optional tapered carbon fibre mast, fractional 3-spreader black painted, or optionally white painted. LED Steaming light, Windex with light, tube for additional electrical wiring and 2 mast steps fitted. Silver anodized aluminium boom with single line reefing (x2) and internal boom outhaul, telescopic vang and with outer purchase block system led to cockpit winch. The Xp 55 is fitted with discontinuous rod rigging throughout with rod turnbuckles. Stainless steel chainplates for headstay, center backstay and shrouds. Headstay is furled using an under deck drum. Furling line led back to cockpit for easy handling. Harken integral hydraulic backstay adjuster for centre backstay fitted as standard. Optional hydraulic panel (manual or electrical) with 4 functions for backstay, vang, outhaul and Genoa halyard tensioner – see price list. The Xp 55 is fitted with a Yanmar 4JH110 common rail engine with a maximum power output of 81kW (110 hp) at 3000 rpm. As standard, the engine is fitted with a 12V/125A alternator for charging the engine start. An additional 24V/60A alternator for charging the main battery bank is also fitted. Engine control panel and throttle/gear lever placed in starboard cockpit coaming. Engine control panel incorporates rpm, hour counter, acoustic alarm for oil pressure and cooling water temperature. An optional electrical throttle/gear lever control can be mounted on steering pedestal at starboard helm. Engine is mounted to the hull structure using vibration reducing shock mounts. The Xp 55 is fitted with a shaft drive made of high tensile corrosion resistant stainless steel. A 3- blade Ø 24” Flex-O-Fold folding propeller with sacrificial zinc anode is fitted as standard. Optional Max-Power bow & stern thruster can also be fitted – see price list. The engine compartment is situated below the cockpit floor and excellent access is provided by removing side walls and companion way steps. The engine compartment is designed to offer superb accessibility to the majority of the systems on the engine. The engine compartment is lined with dense sound proof insulation with aluminium plated surface, to reduce noise and heat in the cabins. The engine bed is part of the hull liner and forms an enclosed engine compartment sump, which is separated from the rest of the boat, to make it easy to keep clean. Aft of the main engine compartment, the optional Fischer Panda generator can be fitted within its own sound proof enclosure.